However, what is important to understand is that everything we see on a global 3D level — the ongoing wars, human rights atrocities, oppression, loss of freedom, surveillance, corporate greed, genetic modification, fluoride in the water, geoengineering, pharmaceuticals, vaccination, religious and political dogma / systems, government corruption, sexual pathologies, racial wars, mainstream media / entertainment mind control, etc… — is the creation of (or heavily influenced) by occult forces that have been ruling over humanity for thousands of years, using their puppet humans to carry out their agenda in classic divide & conquer fashion on un-seen levels. Their primary goal and agenda is and always has been to keep us locked in a frequency prison, feeding off of all the “emotional loosh” that is created through the suffering, polarization, drama, chaos, and fighting between humans, be it on global level via wars or through interpersonal fighting in everyday life. Divide and conquer. It’s about keeping us in a perpetual state of fear and preoccupation on physical survival and limited five-sensory perception and indulgence, disconnected from the deeper wisdom of our bodies and our divinity within, our own inner authority and emancipated selves. We are “GMOs”, genetically modified by hyperdimensional alien forces who are the real architects of the matrix. They see earth and humans as their property and farm, raising us like cattle to be fed upon. Society and modern culture as we know it are an alien-infused creation and not “human”. They have also infused us with dogmatic religious beliefs and a corrupted pop-spirituality we see in the “New Age” — an alien virus. It’s pathology that has become normalized. 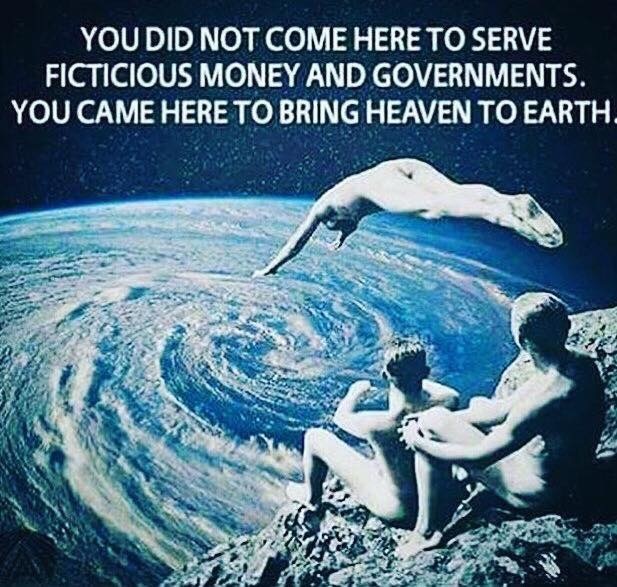 That’s why only focusing on the 3D manifestations of the matrix will never bring about true positive change, nor will change happen through any of the matrix institutions (such as government), but in fact feeds the NAA (Negative Alien Agenda)….literally. It doesn’t matter who you blame or focus on within the 3D level: Government, Illuminati, Zionists, Jesuits, Bankers, Monsanto or any political/corporate figure; they all are puppets themselves. Fighting governments and the psychopathic elite on a 3D level alone will never bring an end to wars and suffering for the “elite” themselves are just pawns and puppets of hyperdimensional negative forces that fully occupy them. Voting and therefore giving consent to be ruled and believing in the religion of government is also an alien mind control construct (as is any of the major world religions), designed to keep people imprisoned out of their own "free will" (trap of agreement) and disconnected from their own inner spiritual authority as they give their power away and become authoritarian followers…..always looking outside for "solutions"..... no matter how well meaning the intention to support another “leader” and political puppet; no matter what party. Just focusing on ecological/environmental issues (GMOs, green energy, etc..) will also never bring about a “better world” in the long run for it is just fighting the symptoms. Again, everything we see as a “problem” to be “solved” on a 3D level is a manifestations of the NAA that has been ruling over humanity for eons, hiding behind a “veil” outside our five sensory perception and distracting us from what is really going on in order to keep us in a frequency prison, locked in 3D physical survival mode and feeding off of us. Ignorance is not bliss, nor is it protection. All of us are influenced by the Hyperdimensional Matrix to varying degrees. People who don't understand how the (unseen) manipulation/control operates, not only in the world at large but through their own minds, can be used as an unconscious “matrix agent“, being played like pawns on a grand chess board. The key in it all in order to transcend the matrix is not only knowledge of what the matrix actually is beyond its 3D manifestation but most importantly sincere self-work, shadow work, embodiment and emotional intelligence in order to anchor the higher frequency of pure and true love, connected to our wholeness within and the wholeness of nature. Love is Light is Knowledge and the gateway to receive Gnosis, higher Knowledge that cannot be perceived via the five senses or our petty little minds. This is the process of “Ascension” and the Time of Transition we’re in now. Love is the most powerful energy and will guide one through the process of wisdom and knowledge. Love, compassion and forgiveness are the foundation to the unlocking of ones mind and freeing ones self.